It's do or die for the four AL playoff teams on Wednesday, as the Blue Jays face the Rangers and the Royals take on the Astros in winner-take-all ALDS Games 5. For just the third time in the wild-card era, both American League Division Series have come down to a single-elimination Game 5. In the entire history of best-of-five playoffs in Major League Baseball, there have been 36 series that went a full five games; exactly half of those series have been won by the team that failed to clinch in Game 4, and one shy of half (17 of 36) have been won by Game 5’s home team. Momentum and home field advantage have proven meaningless. The American League Championship Series starts Friday night and could still consist of any of four matchups. By midnight tonight, we should know which of those four pairs will indeed be playing for the pennant. • The one scenario in which momentum hasn’t proven completely meaningless in a Game 5 situation is when a series that started 2–0 gets pushed to the limit. This is just the 14th time in major league history that has happened in a best-of-five series. In the first 13, the team that went up 2–0 and lost the next two rallied to win Game 5 and the series just five times; the team that staved off elimination in Games 3 and 4 won the series eight times. That may not be a big enough difference to prove significant, but it’s at least a difference. • If we factor in home/road scenarios, however, we lose all sense of precedent. Only twice before in the 2-2-1 format has the road team won the first four games of a best-of-five series. In one of those, the home team won Game 5; in the other, the road team won. The latter, however, bore significant resemblance to this series. That was the 2010 ALDS between the Rangers and an AL East opponent with an artificial turf field, David Price as its ace and home field advantage in the series. In that series, Texas won the first two games on the road, only to lose the next two in Arlington. The Rangers then sent the lefthanded ace they acquired at the trading deadline to the hill for Game 5; Cliff Lee dominated that game, going the distance to beat Price and the Rays. In today’s Game 5, the Rangers are hoping to replicate that success with Hamels, Lee’s former rotation-mate in Philadelphia. • Of the four pitchers starting Games 5 today, Hamels has by far the most postseason experience and would seem likely to be the least affected by nerves. However, none of Hamels’s previous 14 postseason starts took place in a single-elimination game. Still, his postseason record is excellent: He struggled in the 2009 playoffs, but all ten of his playoff starts outside of that October have been quality, and even with '09 included, his career postseason ERA is 3.05. • Hamels worked seven innings of Game 2 of this series, giving up four runs, only two of which were earned, on six hits with six strikeouts and no walks. No Blue Jay reached base multiple times against him, but Josh Donaldson hit a first-inning home run off of him. Hamels is the fourth consecutive lefthanded starter that Toronto's righty-heavy lineup will face in this series, and the most striking aspect of his platoon split this season was how much more frequently he allowed home runs to righthanded batters than lefthanders. Hamels allowed just two home runs in 194 plate appearances against lefties this season, or one every 94 PA, but 20 home runs in 686 PA against righties, or one every 34.3 PA.
• Their pitching lines suggest that Hamels and Stroman battled to a tie for seven innings in Game 2, but Stroman actually left that game with a lead, having allowed just three runs (two earned) through seven innings. He then gave up a single to Delino DeShields to lead off the eighth inning, was removed and watched as the Jays’ bullpen let DeShields score. Collectively, the hitters in the Rangers’ ALDS lineup have hit .152/.184/.174 against Stroman in his career, and DeShields is the only one with multiple hits or an extra-base hit off of him, having doubled to lead off Game 2 before picking up that crucial eighth-inning single. • Though this series is tied, the Jays have out-hit the Rangers by a fair margin, outscoring Texas 20–16 and hitting .233/.303/.420 with six home runs, ten doubles, 13 walks and four stolen bases to the Rangers’ .213/.256/.280 with two homers, four doubles, seven walks and one steal. Toronto’s leading hitters have been Donaldson (4-for-14 with a double, two homers and three walks) and Kevin Pillar (7-for-17 with two doubles and a homer), while only Ryan Goins (0-for-13, walk) has yet to contribute with the bat. For Texas, Mitch Moreland (0-for-10, walk), Josh Hamilton (2-for-15, no walks or extra-base hits) and Prince Fielder (2-for-16, walk) have all struggled thus far. • The struggle of those three lefties has been fortuitous for the Jays, as they lost their best lefthanded reliever, Brett Cecil, to a calf strain suffered in Game 2; rookie righty Ryan Tepera, who has yet to appear in this series, replaced him on the roster. The Jays are also unlikely to have Price available as a relief option this game after he inexplicably threw 50 pitches in Game 4. Price and manager John Gibbons apparently disagree on his availability for this game, with Price saying he’ll be ready to go and Gibbons saying he won’t be an option. Gibbons, who seemed to be using up Price on purpose in Game 4, may be basing that opinion as much on the fact that the lefty has allowed eight runs in 10 innings of work in this series as on the number of pitches he threw on Monday. As for the Rangers, Colby Lewis, who threw 60 pitches in Game 4, likely won’t be available, but Game 1 starter Yovani Gallardo should be. • The big question coming into this game is whether the Astros can recover from their devastating loss in Game 4. Houston had a 6–2 lead and was six outs away from winning the series when the Royals scored five in the top of the eighth inning, then added two more runs in the ninth to ice a season-saving 9–6 win. Such a loss often results in what I call a dead-team-walking scenario, in which a team that loses the penultimate game of a series after being a mere handful of outs away from a series victory proves unable to shake off the shock in the decisive final game. Think of the 1986 Red Sox in Game 7 of the World Series, the 2002 Giants in Game 7 of that World Series, the '03 Cubs in Game 7 of the NLCS, the '11 Rangers in Game 7 of the World Series, the '97 Yankees in Game 5 of the ALDS, the '04 Yankees in Games 6 and 7 of the ALCS, or the '85 Cardinals in Game 7 of the only World Series the Royals have ever won. Each was a relatively listless loss following a still-memorable, season-saving, late-inning comeback by the eventual series victor. This game fits that scenario for the Astros, who not only failed to nail down the series on Monday, but also have had to wait two days and travel to their opponent’s ballpark to get another chance. • Both of the Royals' wins in this series have been comebacks in which Astros reliever Will Harris has featured prominently. In Game 2, the Astros had a 4–2 lead in the sixth, only to allow the Royals to tie the game in the bottom of that inning. Harris then entered that game in the seventh inning and gave up a triple and an RBI single to the first two men he faced, Alcides Escobar and Ben Zobrist, taking the loss in the eventual 5–4 Kansas City win. In Game 4, it was Harris who could not stop the Royals' conga line in the eighth, giving up four straight singles (including one each to Escobar and Zobrist) to start that inning before getting removed, arguably too late, by manger A.J. Hinch. Harris had an outstanding season for Houston, posting a 1.90 ERA and 0.90 WHIP in 68 relief appearances. But in his last 16 appearances dating back to Sept. 12, he has been charged with 10 runs in 12 2/3 innings and allowed two of his five inherited runners to score, taking the loss in four of those 16 games. • Cueto is still searching for his first quality postseason start. He fell an inning shy in his playoff debut against the Phillies in the 2010 NLDS, but lasted just six pitches in his lone postseason start in 2012 due to an oblique strain and was lit up by the Pirates in the wild-card game the following year, appearing visibly shaken by the raucous PNC Park crowd. Cueto's lone start in this series came at home in Game 2, but the Astros got to him early, scoring a run in the first and two in the second, then adding a solo homer in the third from Colby Rasmus, who has now hit .379/.455/.724 in 33 career plate appearances against Cueto. 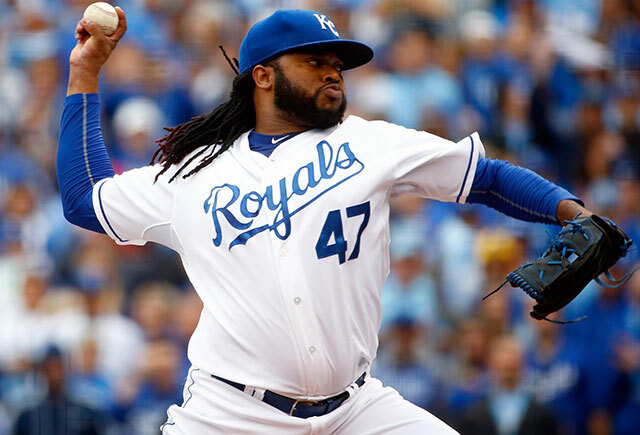 It was only after the Rasmus homer that Cueto settled down, retiring eight in a row and ultimately completing the sixth inning without further damage in a game the Royals came back to win. • Carlos Gomez did not appear in Game 2 due to the intercostal strain he was nursing at the time, but he has slugged .917 in 12 career plate appearances against Cueto (4-for-12 with a double and two homers). He is likely to be in the lineup tonight after starting Games 3 and 4 and homering in the latter. Gomez’s line this postseason, meanwhile, greatly resembles his career line against Cueto (4-for-12 with two homers but no doubles). • McHugh is the only one of today’s four Game 5 starters who started Game 1 for his team; he thus makes this start on an extra day of rest. McHugh earned the win in Game 1 with six strong innings of work, with a pair of solo home runs from Kendrys Morales as the only blight on his record. Curiously, those homers represent the only times Morales has reached base against McHugh in eight career pate appearances. Zobrist has had a wider range of success against McHugh, going 3-for-8 (.375) with a double, a triple and a walk. • Zobrist has been the Royals’ leading hitter in this series, going 6-for-16 (.375) with a double, a walk and a stolen base. However, Morales and Salvador Perez have each homered twice. Perez came out of Game 4 due to concussion concerns after he was hit in the mask with a foul ball, but he has cleared all concussion tests and will be in the Royals' lineup for Game 5. • The Astros have only outscored the Royals by one run in this series, 19–18, but they are out-hitting them by a fair margin, .267/.349/.480 to .235/.316/.434. Kansas City, however, has struck out 16 fewer times, stolen three more bases and only trails Houston by one home run, seven to eight. Rasmus, Carlos Correa, Chris Carter, George Springer and the centerfield combo of Gomez and Jake Marisnick all have an OPS of .900 or better in this series, but no other Astro has an OPS better than .500. • With no reliever on either team having thrown more than 26 pitches on Monday and a day off on Tuesday, the only pitchers unavailable on either team should be Game 4 starters Yordano Ventura and Lance McCullers, though the Astros may want to avoid Harris if at all possible.